Tomatoes stuffed with mushrooms and vegetables | Jover Pons S.L. Cut the tops off the tomatoes, scoop out pulp and seeds and put aside the empty tomatoes and lids. Drain the water and poach in syrup the tomato pulp in a pan with oil, salt and a pinch of sugar. Meanwhile, peel and chop the chive and the garlics and fry them at a low temperature. Season. Cook until they are a little browned, then add the manually chopped mushrooms and sauté them until they lose water. Crack the eggs in a bowl, beat, add chopped parsley, season and mix in the sauteed vegetables. Move the mixture into a frying-pan so that it slowly sets. 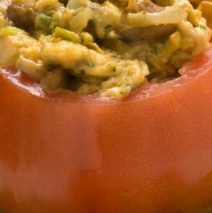 Spread the candied tomato over the empty tomatoes and top with the scrambled eggs with mushrooms. Cut lettuce in julienne style to prepare the dish on a bed of lettuce. Season. Place a stuffed tomato and dress with oil, balsamic vinegar and salt. Garnish with parsley. Advise: when cooking the tomato it is adviseable to add the same amount of sugar than salt to avoid a slightly bitter taste.